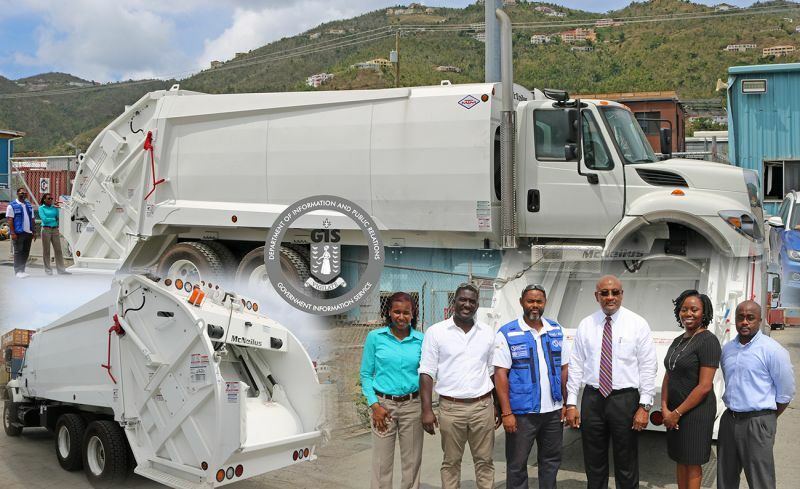 ROAD TOWN, Tortola, VI – The Virgin Islands’ (VI) Department of Waste Management, has been gifted a garbage truck from the Pan American Health Organization (PAHO), to assist with its waste collection. The keys to the 2018 International 7600 SBA, garbage compactor, was handed over to Manager, Mr Greg R. Massicote following a donation this week. PAHO Consultant, Mr Ronnie Lettsome said it has been a pleasure in providing the truck to meet the Territory’s needs in controlling waste. The Pan American Health Organisation is an international public health agency which works to improve health and living standards of the people of the Americas. Since the passage of hurricanes Irma and Maria in 2017, PAHO has contributed an estimated $1.3 million to support health response in the VI. The Ministry of Health and Social Development aspires to provide a caring and integrated system of health and social services that facilitates the recovery of human development and quality of life in the VI, according to the GIS release.